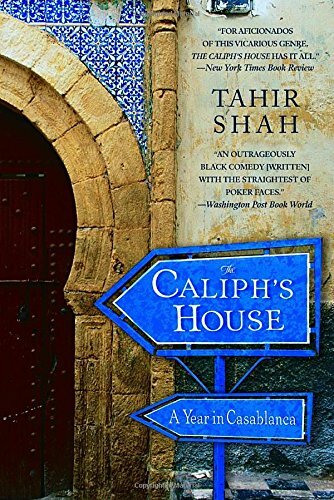 The Caliph's House is a fabulous story about a family's year spent in Casablanca renovating an old, sprawling Moroccan villa. Told with honesty and humour, Shah details the many missteps along the way and provides good insight into some of the customs and superstitions of Morocco which combined make this an extremely pleasant way to while away the time. Yearning for an escape to a land away from the drab London sky, Shah spurns the usual "British boltholes" of Spain and southern France and relocates with his family to Morocco. Having checked out potential places of abode in Fes and Marrakech, by circumstance he hears of a neglected place in Casablanca situated in the middle of a shanty town called Dar Khalifa or the Caliph's House. Falling in love with Dar Khalifa, even being knocked to the floor by an explosion set off by suicide bombers when signing the deeds does nothing to deter his plans to make this his home. For Shah, moving to Morocco is also a chance to revisit a country he used to travel to as a child. A country of colour, smells, sounds and wonderful memories so distantly removed from the life he was leading back in the United Kingdom. On taking possession of Dar Khalifa, Shah inherits three "guardians" with the house. Primarily employed to act as security guards, the guardians spend most of their time fretting over the invisible, wicked jinns that they believe co-habit the house. This is just one of the myriad of cultural differences that Shah has to deal with by immersing himself into such a radically different culture. His experiences with hiring locals to undertake both the day to day running of the household and renovation of the house, is told in amusing fashion and the mere mention of courtyards, cedar woods, mozaics and fountains conjures up wonderfully exotic scenes. There is much more to The Caliph's House, than just a simple story about an ex-pat renovating a house. It is a well crafted story that reveals secrets during its telling. The secrets of its inhabitants, its neighbours, Shah's family who have a connection back to this amazing country and of the house itself. These are slowly revealed over time and told in entrancing fashion that can't help but draw you in. Like the artisans Shah uses to renovate his house, there are lots of delightful intricate touches that make The Caliph's House such a delicious read. Shah's many and varied relationships he makes along the way, the amusing and apt proverbs that begin each chapter and the underlying difficulties of an outsider trying to make a life in such a different culture are all woven together to create a wonderfully tight story. Even the odd outlandish story which appears to use a fair amount of poetic license adds just the right amount of spice. For those interested in a story about taking risks and not being subdued by other's expectations, this is a book that is well recommended. Also, for those who enjoy The Caliph's House and want more, there is comfort in knowing that Shah continues his Moroccan experiences via his well-regarded travelogue In Arabian Nights.